This is our company’s cornerstone core value. 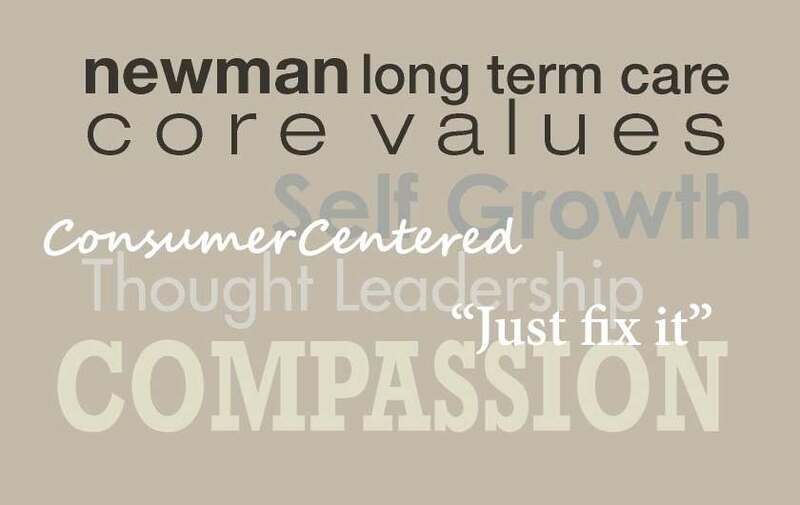 While Newman LTC’s customers are actually financial planners and insurance agents, who are acting on behalf of their clients; everything our company does is ultimately driven for the benefit of the consumer and ensuring that they have in place their very best long term care plan. This Core Value embraces our desire to treat all stakeholders, including employees and vendors, who we serve with dignity and respect. In particular, we listen to our clients and their family members when they have concerns or questions about their policies or have any issues regarding long term care or benefits. We lend them our ear and coach them to a resolution, aiming at really finding out what is wanted by consumers and agents. Newman LTC is recognized as the preeminent leader in long term care planning in Minnesota. Our CEO and other key Newman LTC executives are involved in industry groups, media outreach, public speaking and serving on panels and commissions to spread the word about the importance of long term care planning. We also support and participate in the debate of state legislation that furthers this goal. Newman LTC holds all of its employees to the highest ethical standards and conducts its business in a like manner with all its stakeholders. As a part of our corporate DNA, we foster a culture of “Just Fix It.” It is the antithesis of blaming. This means we place great importance on helping to fix problems as soon as possible rather than affixing blame to anyone. At Newman LTC, the company empowers employees to fix problems. Newman LTC encourages all employees to tackle new challenges, opportunities and dreams, whether professionally or personally. We encourage one another to be the best in our personal pursuits whether that is photography, jewelry making, stand-up comedy or learning a new language. We believe it is important to be surrounded by people who are achieving their personal goals.